Jeannine Roberts Royce: YOU DESERVE IT! "With arms wide open, welcome what the world has to give you. 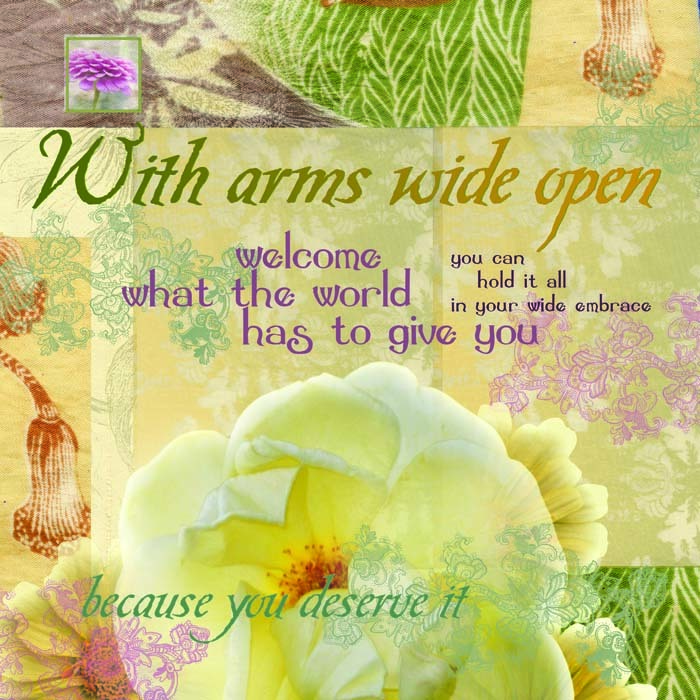 You can hold it all in your wide embrace because you deserve it. "- from my Grateful Heart, Joyful Woman series of illustrations. What does it take to shift our bodies, our hearts, and our spirits into a posture that says we deserve it all, that we welcome what the world has to give us? Sometimes, I think that the root of disharmony, disease and despair in our lives comes from feeling undeserving. We carry a world of unease in our bodies: old memories of hurt, fear, injustice and blame, regret and shame filed away in the cells. A lifetime of destructive messages to ourselves, faulty beliefs that have never been corrected or tossed out. One of the most destructive is the notion that we don’t deserve what the world has to give us. Maybe it’s time to shake loose the old stories. What do you believe about what you deserve? You may not be able to properly heal each story or even identify them all. But a good way to start is to allow yourself a mini respite of self-care and safety – stage a show of love and kindness for yourself. If you have a genuine intention to take care of yourself, love will spring up, will find you and flow through you. If your mini respite involves the bathtub as mine often does (with all the accessories of scent and oil and candles and music), there’s something about the warm water, the womb of safety, that disarms you so love can flood you. Thus disarmed by my own self-kindness I find myself cleansed on many levels. It’s a purifying kind of love that bubbles up when you surrender to it. You'll know without question that you deserve it. YOU DESERVE IT!